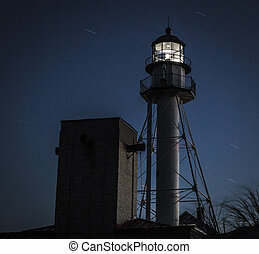 The crisp point lighthouse is located in michigan's upper peninsula on the shores of lake superior. 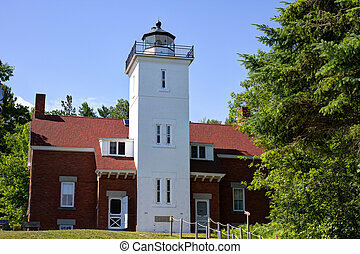 the light was built in 1875, owned by luce county and maintained by volunteers. 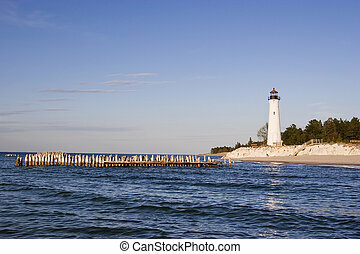 Image of the Crisp Point Lighthouse at sunset. 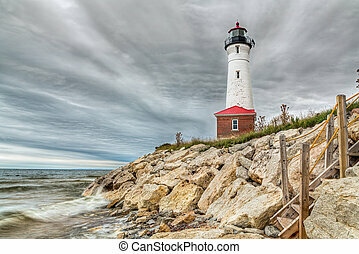 Under dramatic clouds, the historic Crisp Point Lighthouse stands on a very remote stretch of Lake Superior coast in Michigan's Upper Peninsula. 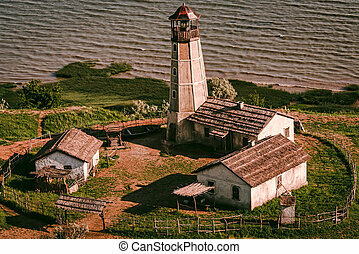 Lighthouse in Sevastopol. 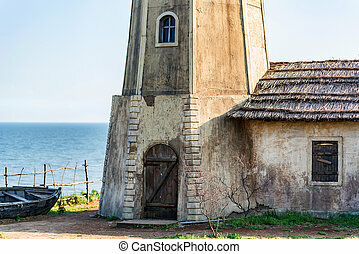 Crimea, Ukraine . 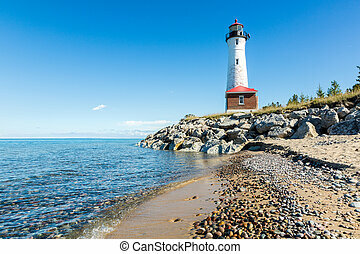 Stony Lake Superior Beach with Crisp Point Light in the background. 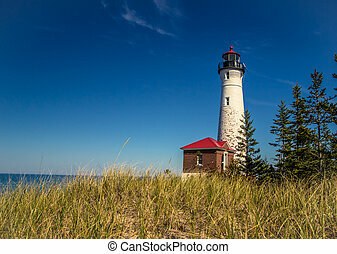 Crisp Point Lighthouse is located in Michigan's Upper Peninsula on the shores of Lake Superior. 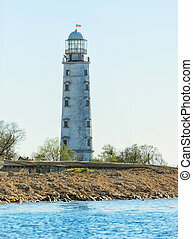 The light was built in 1875 and is currently owned by Luce County and maintained by volunteers. 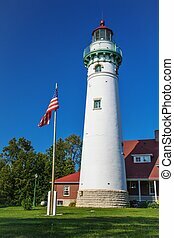 The Point Betsie Lighthouse located along the shores of Lake Michigan. Point Iroquois Lighthouse located along the shores of Lake Superior, is owned and operated by the Hiawatha National Forest. 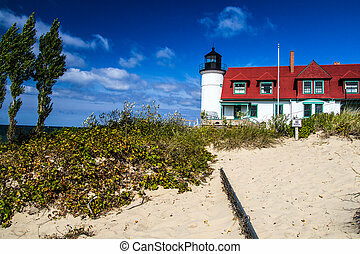 The Tawas Point Lighthouse has stood on the shores of Lake Huron for over a century. 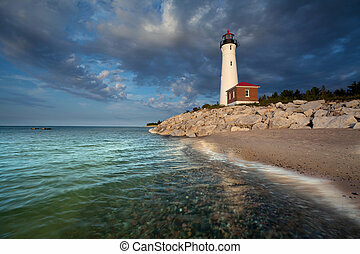 Tawas State Park. 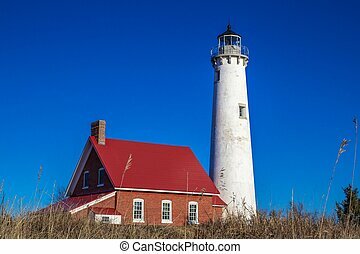 Tawas City, Michigan. Forty Mile Point Lighthouse along the shores of Lake Huron. 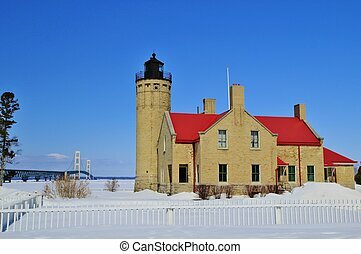 Winter at the Old Mackinac Point Lighthouse with the Mackinaw Bridge as the backdrop. 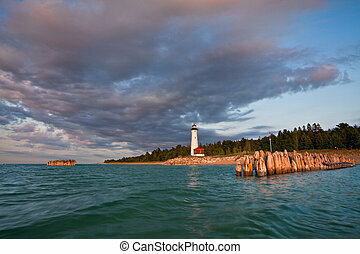 Mackinaw City, Michigan. 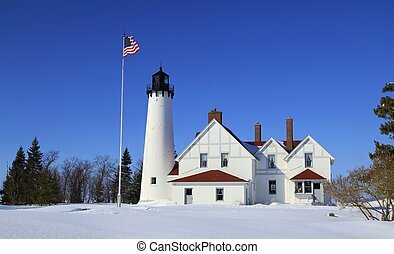 Historical Seul Choix Point Lighthouse is an active light along the Great Lakes shoreline in Michigan's Upper Peninsula. 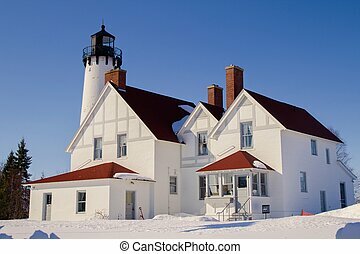 Lit in 1849, the Whitefish Point Light is the oldest light on Lake Superior. 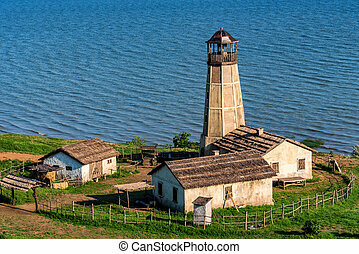 It is on the southern shores of the Great Lake on what is known as the Graveyard Coast due to the amount of ships that have sank off this coast. Paradise, Michigan. 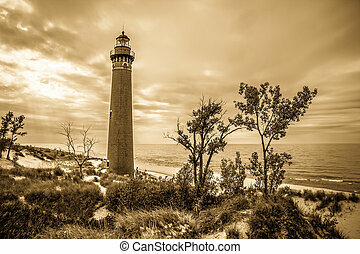 The Little Sable Point Lighthouse has been guiding mariners through the treacherous waters of the Great Lakes for over a century. Silver Lake State Park. 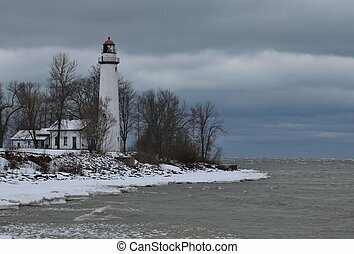 Mears, Michigan. 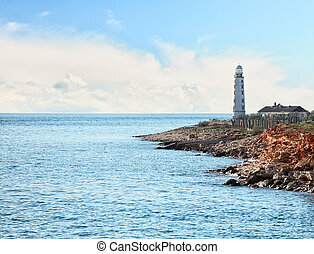 The Forty Mile Point Lighthouse was completed in 1896 and is on the Lake Huron coast. 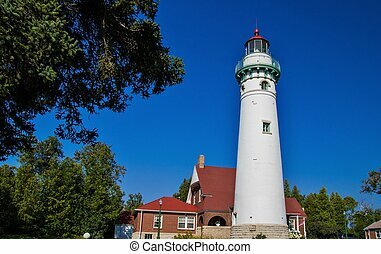 The light is owned by Presque Isle County and the grounds are open to visitors. 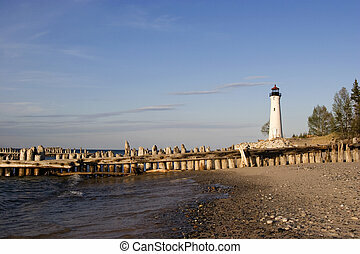 The Point Iroquois Lighthouse on the shores of remote Lake Superior. 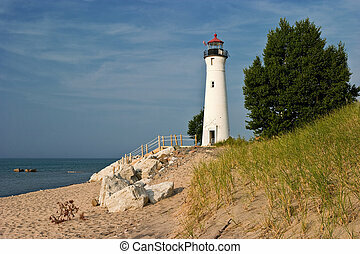 The lighthouse is part of the Whitefish Bay Scenic Byway within the Hiawatha National Forest. 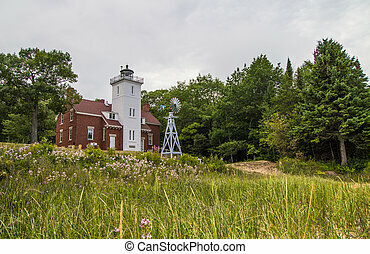 Brimley, Michigan. 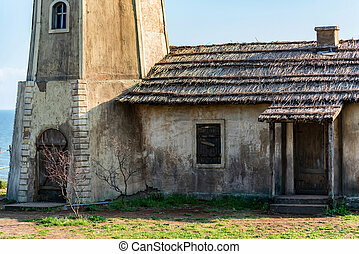 This structure is owned by the National Forest and is not a private residence. 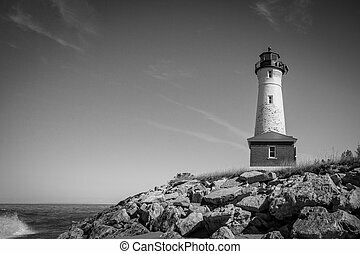 Lighthouse on a remote windswept wintry shore. 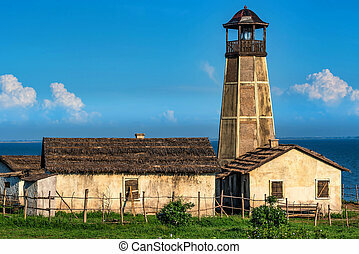 Point Aux Barques Lighthouse. 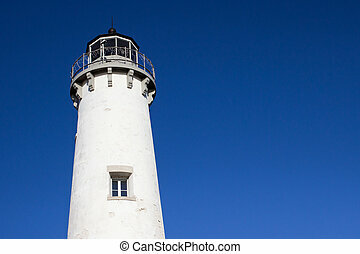 Lighthouse Park. 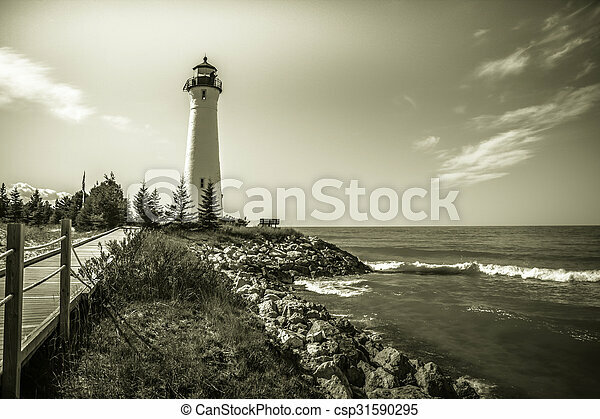 Port Hope, Michigan.